Here's all the essential tips that you need to know for delving into Wargroove, as well as a complete beginner's guide. 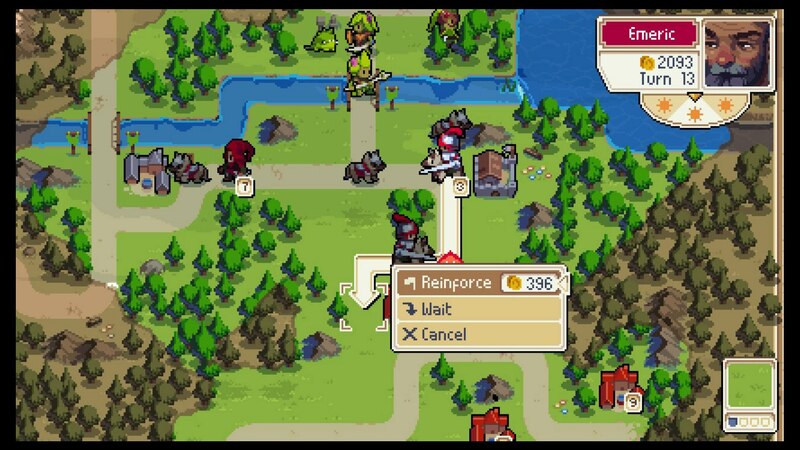 Wargroove is an especially stylish game from developer Chucklefish, and sees you controlling anime armies from up high to dominate the battlefield. In this Wargroove beginner’s guide, we’ll firstly be giving you a story primer and a overview of the minuche of the game, before delving into some essential Wargroove tips that all commanders should know. By now we’ve spent tens of hours with Wargroove, and we’ve ultimately come away pretty impressed. For our full thoughts on the new game from Chucklefish, you can head over to our Wargroove review. Wargroove is a top-down, 16-bit anime strategy game, and it’s damn wonderful. You’ll take turns moving your troops around the battlefield, figuring out where best to move to combat enemy troops. The battle is often over when a Commander (the elite leader of an army) is defeated, or if one side has no more troop units remaining. Wargroove is also really tough. It’s a pure strategy game all about figuring where best to move next, while putting your units in a constant position to succeed. One wrong move, and an entire unit can be easily wiped out by a single attack from an enemy unit. In a single Wargroove turn, you can move any and all units that you please. Your units can move, and then they can either attack, or wait, hunkering down and biding their time until your next turn. There are some exceptions to this rule, such as trebuchets, that can only move or attack in a single turn, but this is genuinely the rule with every unit in Wargroove. Plotting where to move a unit is key. Whenever you go to move a unit, your cursor will hover over all the available tiles that your unit can move to. When hovering over a tile, you’ll be able to see in the bottom right corner of the screen if that tile is either going to offer protection to that unit, or open them up and leave them vulnerable. Putting a unit on a mountain for example, will give them a huge defence boost, negating incoming damage, while putting a unit in a river will decrease a unit’s defence, leaving them open to attack. When selecting one of your own units to attack an opposing unit, Wargroove basically comes down to a giant game of rock, paper, scissors. Hover over a unit and press B on the Switch or A on the Xbox, and you can see all the key information for that unit. Let’s take the cavalry unit that you can see below. On the top of the two rows near the bottom of the screen, you can see the units that they’re effective against in combat. But on the bottom row, you can see the units that will obliterate them in straight combat. Picking your battles is key to winning a game of Wargroove. 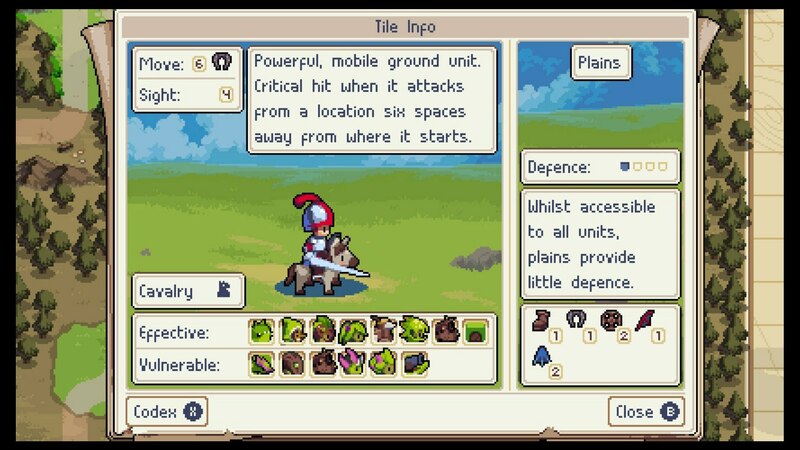 But, remember that while Wargroove doesn’t have ‘difficulty’ levels as such, it does allow you to tweak combat settings. In either the Campaign or the Arcade mode, you can tweak the amount of damage that your units will receive, if you’re struggling to make it through a certain battle. Now that we’re done with the basics of playing Wargroove, we can move on to more complex matters. Just below, you can find a complete list of all our essential tips for winning as a Commander on the battlefield. No matter which Commander you’re playing as, whether it’s Mercia or Greenfinger, you’ll always have a ‘dogs’ unit at your disposal. If you can place your dogs on a mountain around the map, your range of vision will be significantly extended. This is absolutely critical when you’re plotting your next move in Wargroove. The ability to see over large parts of the map and determine where enemy troops are will always be a deciding factor in whether or not you ultimately emerge victorious. At the beginning of every battle in Wargroove, your army will start out with a certain amount of gold. You can always see the current amount of gold you have available to spend in the top left corner of the screen. You can then take this gold, and then spend it at your main Stronghold (your biggest one) to deploy more troop units onto the battlefield. The cost in gold will vary between units, so for example a unit of cavalry will cost more than a group of soldiers, but forgetting to resupply your army every turn can be disastrous. 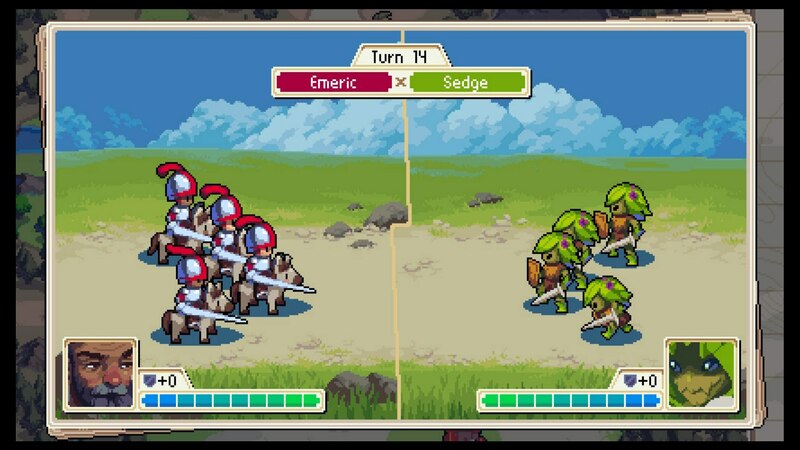 Although they might look pretty at first, the battle animations can become pretty tiresome in Wargroove, and they extend the average length of a game by a good few minutes overall. To skip the battle animations as they're happening, simply hold down B on your Switch. Alternatively, holding B while your AI opponent is taking their turn will fast forward the game, speeding up an entire match of Wargroove. Wagon units are introduced fairly early on in Wargroove. In the campaign, you’re going to come across them during a mission where Mercia has to ferry units of citizens out of the battlefield and to safety. It can be really easy to forget to use Wagons later on in Wargroove, but they’re amazing for getting your units round the battlefield quickly. For example if you have a unit of pikemen, who can only move three tiles per turn, a Wagon can be great for transporting a slow moving unit like them over 10 tiles in a single turn. There can be times in Wargroove where you’re uncertain where to move units. Maybe because there aren’t any enemy units immediately ahead of you, and parts of the battlefield are still shrouded in fog. In situations like these, never leave your units out in the open battlefield at the end of their movement. You never know when enemies are going to emerge, and from which direction, so it’s always invaluable to finish a unit’s movement in some terrain that grants them a degree of protection from attacks, like mountains or forests. 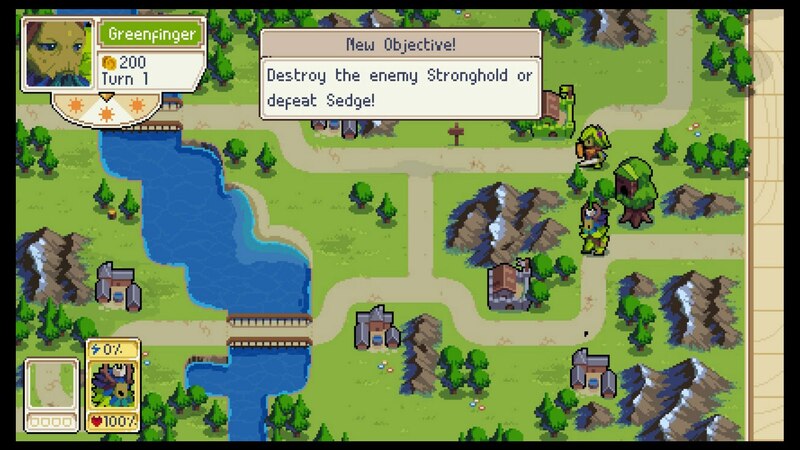 It can be really tempting to send your Commanders in alone in Wargroove, thinking they can take on multiple enemy units and still be standing at the end of the fight. Don’t give in to this temptation, and always back your Commanders up with a few troop units. There’s nothing worse than having your progress in a battle completely wiped by the enemy taking out your Commander. Speaking of Commanders, there are 12 of them in the game, that you can unlock to play as in the Arcade mode of Wargroove. For a full walkthrough of how to unlock Commanders for this mode of the game, make sure to head over to our Wargroove Commanders guide. And with that, we’ve imparted all the information we can on Wargroove. We’re still working our way through the Campaign and Puzzle modes of the game, and we’ll be updating this guide where necessary.